In 2016, both the Democrat and Republican presidential nominees argued that student loan debt was too high and was harming young Americans. Indeed, Hillary Clinton made reducing student loan debt a centerpiece of her campaign. The Trump campaign, while light on specifics, also gave support to this idea. For her part, Clinton incorporated a vision similar to the legislation introduced in Congress in 2013 by Sen. Elizabeth Warren (D-MA), which would allow existing borrowers to refinance existing student loans, thereby opting to lower the interest rates on their outstanding loans to current, historically-low rates. In a surprising moment of bipartisan consensus, President Donald Trump has also suggested that borrowers should be able to lower their student loan interest rates, though it was not included in his first budget proposal. The popularity of refinancing proposals is a result of the unique way in which interest rates are set on federal student loans. Private loans, including mortgages and other personal loans, carry interest rates determined by the dollar amount and time horizon of the loan, as well as an assessment of the level of risk involved in lending to a particular borrower. In contrast, interest rates for federal student loans are set by the U.S. Congress and are not differentiated for individual borrowers. This means that a student with bad credit and a low bank balance enrolled in a low-quality program with poor earnings potential can borrow with exactly the same terms as an independently wealthy straight-A student at Harvard. Interest rates on federal student loans in no way account for the individual’s risk of default. Refinancing advocates argue that they are leveling the playing field for student loan borrowers. However, many students are unable or unwilling to refinance for a lower rate. Private lenders are able to chose which borrowers they offer refinancing services to and at which rates, and these lenders often only want to refinance borrowers with high, stable incomes. Furthermore, borrowers themselves often do not want to refinance in the private market because doing so eliminates the generous protections, including income-based repayment (IBR) plans and loan forgiveness, that come with federal student loans. Allowing students to refinance through the federal government would make the benefit much more widely available, and it would allow borrowers to retain federal protections. In 2014, the Congressional Budget Office estimated that if implemented, Warren’s plan would cost taxpayers just under $60 billion over a three-year period. 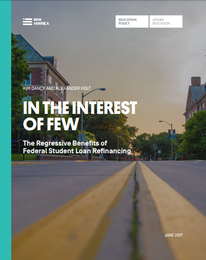 In the Interest of Few builds on the existing research on student loan refinancing by providing a detailed breakdown of the changes to borrowers’ interest rates, monthly savings, and total savings over the remaining repayment period, along with analyses of how each of these figures varies according to borrower demographics. Although many households would be eligible for refinancing, a large portion of the benefits would go to a small number of households with high debt balances. Furthermore, increased outreach to low-income borrowers about the benefits of income-based repayment plans would be more beneficial than refinancing for the population of borrowers most at risk of default. A slight majority of U.S. households would benefit from refinancing. In total, 52.8 percent of households with student debt could potentially lower their interest rate through refinancing. The average interest rate across all student loans is 5.8 percent before refinancing, and drops to 4.2 percent if all eligible borrowers refinance. On average, households would save $8 per month. Borrowers who have not earned a bachelor’s degree would see the smallest difference, in part because their current monthly payments are already relatively low; the average borrower with only a high school diploma saves about $7 a month. Meanwhile, the typical student with a bachelor’s degree saves $9 per month, as does the typical borrower with a master’s or professional degree. This difference in savings stems from the fact that borrowers with higher levels of educational attainment typically have higher amounts of debt, making a lower interest rate more valuable to these borrowers. For the total amount paid over the life of a loan, the average household would save $941 in nominal dollars, paying off a total of $30,988 in principal and accumulated interest without refinancing, compared to $30,057 with refinancing. Borrowers with bachelor’s degrees save slightly more—$1,111 in nominal dollars, on average, over the life of the loan. These borrowers typically have taken on higher debt loads in order to get through four or more years of schooling, which explains the higher savings they would receive. Among households with current income in the highest quintile, the average savings would be nearly twice as high ($10 per month) than for households in the lowest income quintile ($6). This is largely because borrowers with higher levels of income tend to have greater degree attainment and have borrowed larger sums to pay for their degrees. Hispanic households would save more than white households, both in terms of monthly payments and total payments, while black households would save less than either white or Hispanic households. This is likely because Hispanic families reported having much larger interest rates before refinancing, on average 6.5 percent. These rates drop to 4.2 percent on average after refinancing, the largest cut for any group. Of the total costs of refinancing, more than half (50.8 percent) of the total benefits would go to households in the highest two income quintiles.